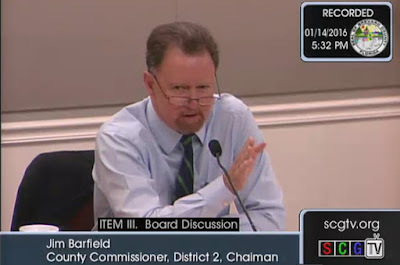 VIERA, Florida -- After realizing that he would not be able to obtain the four votes necessary to impose an additional 6 cent per gallon gas tax for road maintenance, Brevard County Commissioner Jim Barfield gave up on his tax increase proposal during Thursday's Brevard County Commission workshop meeting. "I can tell you that I am not in favor of a gas tax" Commissioner Curt Smith said. "So, with [Commissioner] Trudie's [Infantini] vote, that's going to kill that." "It means it's dead," Barfield said of Smith's intention to vote no on the gas tax. "So what that means is that it won't go to the County Commission to be voted on. It is over." The vote had been scheduled to take place at the January 26th Brevard County Commission meeting. Commissioner Andy Anderson suggested that instead of a gas tax, the Commission place a half-cent sales tax referendum on the ballot. "We've been asked by the cities," said Anderson. "Let's put it on for the voters to decide." "Y'all want to kick the can. Kick it. I don't care," said Commissioner Robin Fisher, who strongly supported the tax increase. According to a Blue Ribbon Advisory Board for Transportation Infrastructure report, the gas tax hike would have generated $7.8 million and the half-cent sales tax increase would generate $17.56 million in revenue for the County and Brevard's municipalities. The Advisory Board estimated that the average household cost for a half-cent sales tax is $67.50 annually. The 1/2 cent sales tax for roads is in addition to the 1/2 cent sales tax already levied by Brevard Public Schools, so that the total sales tax in Brevard County would be 7%.